"Video premiere!! Thanks to Otto Granillo and Junko Seki, I got to get my [New Wave] on producing this catchy tune, "Wallflower" for their group Kotolan. Mixed beautifully by my main man, Stephen Kaye at SunKing Studios," The Lions producer and bandleader Dan Ubick AKA Connie Price enthusiastically wrote on Facebook this past May; just about a month after "Wallflower," Kotolan unleashed their second Dan Ubick-produced single, "Toyko Subway." Trombonist, audio-visual artist, and "OTO" half of Kotolan, Otto Granillo recently told me that he and his wife/bandmate Junko Seki "have been writing an producing singles lately, instead of making an album." Although, Granillo says they're currently "throwing around the idea of releasing a full-length album in the future [with] a group of previously-released singles from a specific year/period" of Kotolan's recent work. Granillo currently plays trombone with Dan Ubick's Soul-Reggae revival group, The Lions and recorded trombone riffs for their third album, Soul Riot (2015) on Stones Throw. It appears as though Kotolan currently features only Junko Seki & Otto Granillo, as well as "honorary member" Dan Ubick. While "Tokyo Subway" only features Junko, Otto & Dan, "Wallflower" additionally highlights the talents of baritone saxophonist David Ralicke and trumpet player Jordan Katz. Kotolan's former La Tienda de Groove-era line-up showcased The Lions players Blake Colie and Eddie Felix, as well as guitarist Carlos Kuhlmann. I would like to bring particular attention an 80's New Wave, Synth-Pop, and 2 Tone Ska playlist featured down below, which was assembled by Otto & Junko, complete with songs that influenced and inspired them while recording "Wallflower," "Tokyo Subway," and their as-yet-unreleased recordings. Now, I'll let Kotolan frontwoman and synth-keyboard player Junko Seki take it from here! "I met Dan Ubick through my husband, Otto, who is also a member of The Lions. Otto had just finished recording trombone at The Lion's Den (Dan's studio) for their second album, Soul Riot, when he brought up to me the idea of collaborating with Dan on our project. 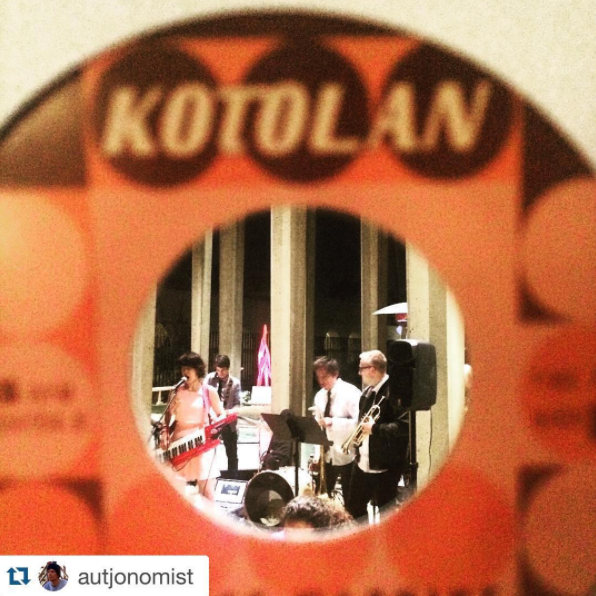 Otto and I started Kotolan in 2008. We explored an eclectic range of styles in our compositions, which you can hear in our first album, La Tienda de Groove, but eventually, evolved to our current sound. Otto and I have a passion for late 70's British and American Rock and early 80's New Wave. Artists like The Cars, Talking Heads, Ultravox, Gary Newman, The Police, Madness, The Jam, The Specials, The Clash, The Selecter, Blondie, Culture Club, Joy Division, Laid Back, and XTC, to name a few. After a discussion with Dan, we decided to collaborate on a couple of singles with a New Wave[-influenced] sound in mind and him taking the role as music producer. Our first single, "Wallflower" took on a Soul-Disco/New Wave sound with synth and guitar lines, along with the three-horn Kotolan sound (trombone, baritone saxophone, and trumpet) we've maintained, since the beginning. Dan played the guitar, drums, bass, and percussion..."
"Our second single, "Tokyo Subway" dug deeper into the New Wave sound with more synths being used. Otto came up with the Micromoog lines and I layered a variety of other synth sounds on top of it. Dan got in the mix, adding even more synth parts, along with playing drums, bass, and guitar. We chose to leave out the horns on this one. Both songs were mixed and mastered at SunKing Studios by Stephen Kaye (also, a member of The Lions) who's got a pretty impressive resume as a mixing engineer. Otto also has a passion for [film-making] and photography (which he did while at Cal Arts working on his master's degree in music) and filmed both music videos. "Tokyo Subway" was filmed in Tokyo, during our recent trip there. Our current plan is to continue releasing singles for now and we'll be collaborating with Dan on a couple more songs this year."